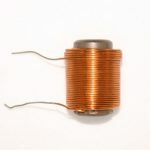 Home / Electronics Articles / What is an iron core inductor? 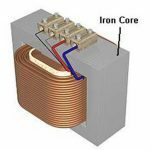 What is an iron core inductor? 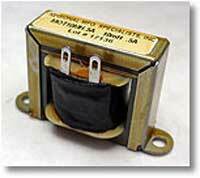 The iron core inductors have a very low value of inductance. In the iron core inductor, by using iron core the inductance value of an inductor can be increased. 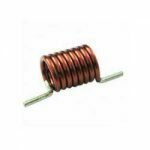 The iron core inductor is the fixed value inductors which have an iron core placed inside the coiled. The construction diagram of iron core inductor is shown in above figure. The line of flux is produced by A.C., when iron core is placed inside a coil. This coil finds a much easier path through the iron core and do not tend to leak to the outside of the core. The line of flux which is produced by A.C. completed their path through iron core. The iron core is gets magnetized and add its flux which produced directly by the current, when a current flows in a coil. Hence the total flux linked with the coil increase that is the inductance of the coil is much greater in an iron cored coil than in an air cored coil of same dimensions. The flux density in the iron core due to the D.C. greatly exceeds that due to the A.C. This may produce the D.C. magnetization of the core. By inserting the air in the core, the unwanted D.C. magnetization of the core. The inductance increases up to a certain point, due to this D.C. magnetization of the core. A large number of turns are wound on a laminated core of soft iron using enameled wire of proper diameter. Laminations reduce eddy current loss in the iron core. 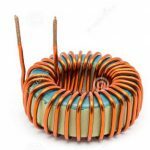 What is a ferrite core inductor?